Those of you who have seen the classic sci-fi film Alien know the story of the ill-fated mining Starship Nostromo, which embarked on a voyage to the far reaches of the galaxy with a crew of seven, only to run afoul of a strange xenomorph, which reduced that very same crew to just one survivor: Lt. Ellen Ripley (Sigourney Weaver). Actually, make that two survivors: Lt. Ripley and the ship's little ginger tomcat Jones, also known as Jonesy. Jones not only makes it through Alien, he survives cryo sleep and make it into the sequel! That's what we call a survivor, baby. And now, thanks to the folks at BloodyDisgusting, we've learned that Jones' terrifying story of survival is finally being told in greater detail. 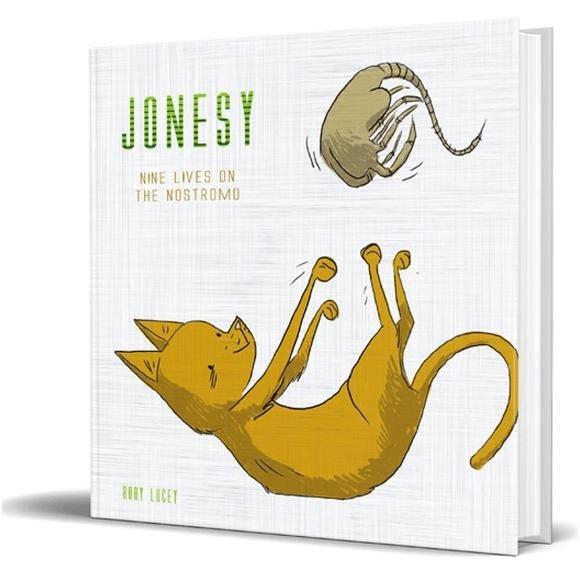 Author Rory Lucey presents that riveting tale in the upcoming Jonesy: Nine Lives on the Nostromo, a full-color illustrated book that gives readers the cat's POV of the entire xenomporph massacre on the ship. In addition, the folks at Mondo are releasing a T-shirt celebrating everyone's favorite space cat, which you can see down below, and which you can order by clicking here. (There's also a black-and-white variant.) With fans debating which direction the Alien franchise should go next, we think the continuing adventures of Jonesy is a good bet. We never did find out what happened to Jones after the events of Aliens...for all we know, he's the ultimate survivor of this entire franchise! Do you think the tale of Jones is worth all this attention? Be sure to let us know what you think down below in the comments. Peep this terrifying xenomorph Funko Pop!